The vibrant colors of coneflowers have been brightening man-made gardens for more than two centuries, according to the British Columbia Ministry of Agriculture. Nurseries and garden stores typically sell the flowers as started seedlings. Provided with the proper growing environment, the seeds also can be used to grow a patch of coneflowers, often at a cheaper price than started seedlings. Stratify the coneflower seeds. Scatter the coneflower seeds onto a paper towel that's moistened with water. Slide the paper towel into a sealed plastic bag and refrigerate for two months. Prepare the garden plot while the seeds go through stratification. Breakup the soil to a depth of 6 to 8 inches. Amend it with 4 inches of compost, according to the Alabama Cooperative Extension, because coneflowers thrive best in soil that's rich in organic material. Follow the compost application with 1 lb. of 12-6-6 all-purpose fertilizer for every 50 square feet of gardening space. Spread the fertilizer over the soil surface. Mix it into the top 2 to 3 inches of dirt with a garden tiller or spade. Scatter the coneflower seeds across the surface of the soil. Drag a rake over the soil surface so that the seeds are buried at depth of no greater than 3/10 inch, according to the British Columbia Ministry of Agriculture. Sprinkle the seeds at a rate of two or three for every 1 square inch of dirt. Spread 1 inch of mulch over the scattered seeds to keep the seeds from being disturbed and protect them from wind and animals. Water the planting area twice daily or as needed to keep the soil surface moist. 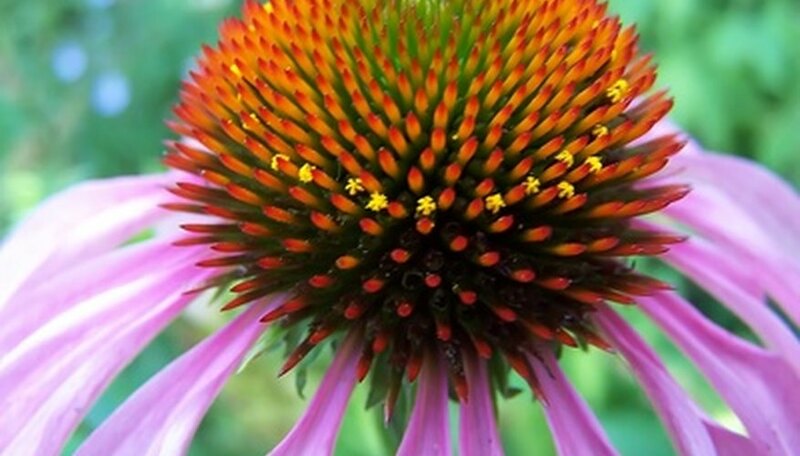 The coneflower seeds will typically germinate within two weeks. Coneflowers will re-seed themselves once established, creating a thick and lush wildflower patch, according toe North Dakota State University.